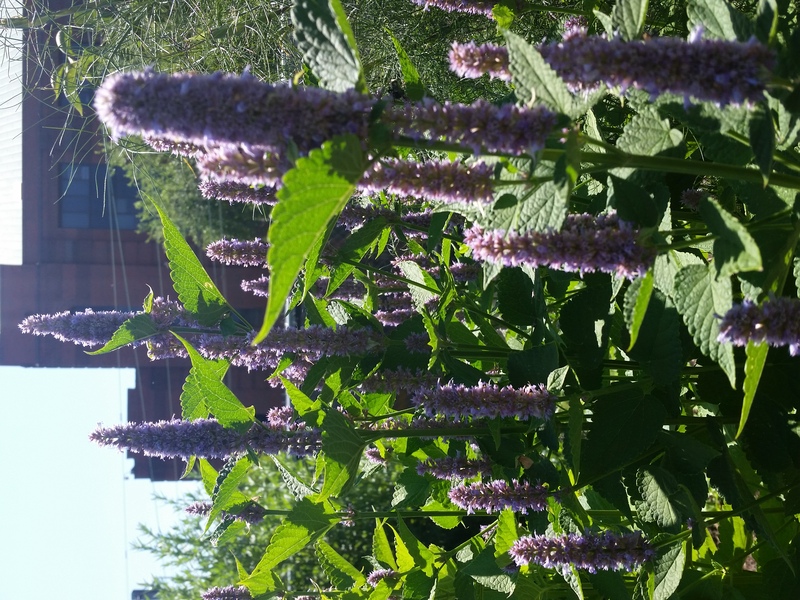 A POP pollinator garden favorite, anise hyssop (Agastache foeniculum) attracts many species of bees in Penn Park orchard. All POP orchards include perennial flowers and herb gardens to attract pollinators and other beneficial insects. Why do we garden? Access to whole foods, exercise, fresh air and sunlight, community, a sense of purpose, beautifying underutilized environments — the list goes on. What about gardens as habitat for non-human neighbors? As an environmental scientist and gardener, I am fascinated by the potential of green spaces to promote the wellbeing of our non-human neighbors in urban landscapes (particularly when it comes to pollinators). The human-centric design principles driving urban development as we know it are not sustainable. We can no longer afford to design, plan, and build human communities without cultivating an awareness of how our actions might impact the web of life inseparable from the land we seek to value and co-opt. The environmental pressures of our time, ranging from growing urban populations to climate change and manmade pollution, require a different framework if we are to overcome them. Enter biophilia, or love of life. The biophilia hypothesis, from biologist E.O. Wilson posits that humans are hardwired to seek connectedness with nature. Incorporating biophilic design and planning into cities is about raising awareness or sensitivity to the natural systems occurring in a particular space. The percentage of urban residents is expected to rise from 54% to 66% by 2050. Through this ongoing urbanization will we find ways to minimize our impact, while simultaneously stewarding and fostering the wellbeing of the natural world? What are pollinators anyway? An animal that moves pollen from the male anther of a flower to the female stigma of a flower. Cool…so why is that important again? Because it brings life! Pollinators come in many shapes and sizes — including insects (honey bees, bumblebees, pollen wasps, ants, lepidopterans (butterflies and moths), etc. ), birds (hummingbirds, sunbirds, honeyeaters, etc. ), bats, and more. These critters are always on their grind; helping pollinate over 75% of our flowering plants and making possible an estimated one-third of all food and beverages (U.S. Fish & Wildlife Service, 2017; U.S. Department of Agriculture, 2013). Do you like apples, blueberries, squash, almonds, chocolate, or coffee at all? Well then, you better start liking pollinators, too, because all of these amazing foods depend on our busy friends! The lives of many other organisms (besides humans) also depend on the the fruits and seeds provided by flowering plants. Still not convinced? Let’s put some numbers on it. $19 billion of U.S. crops in 2010 were pollinated by honeybees. Pollination by other insects contributed about another $10 billion in crops. Despite the immense economic and natural value of pollinators, we still engage in agricultural and urban development activities that put these irreplaceable allies at risk. A National Academy of Sciences study found that honey bees and some wild pollinators are declining in North America. While declines in wild pollinators have been attributed to habitat loss and degradation, managed bee declines are linked to disease from introduced parasites and pathogens (Berenbaum et al. 2007). A Harvard study found evidence linking pesticides used on crops to colony collapse disorder (CCD) in honeybees. “Habitat fragmentation” is a critical concept in the fields of landscape ecology and conservation biology. Habitat fragmentation describes the process of habitat loss through the division of larger, continuous habitats into a number of smaller patches, isolated by a matrix of dissimilar habitats. Cities are extreme examples of fragmented habitats; with green oases separated by large, inhospitable blocks of steel and concrete. The good news is that even a little bit of urban green space can help mitigate habitat “patchiness.” For example, researchers have shown that informal urban foraging zones, such as backyards, green roofs, and planted boulevards can act as natural corridors, supporting native pollinator abundance and diversity (Rudd et al. 2002; Tommasi et al. 2004; Colding 2007; Goffard et al. 2010). As planners, designers, and growers this is really exciting! It means that the green spaces we help make possible can support the wellbeing of the urban biota. This is where design takes center stage. Pollinator habitat design in urban spaces can be both large and small in scale. Let’s first run through some best practices to follow when designing a pollinator garden for your own space. Native Plants. Pollinators love foraging for the pollen of native plants. 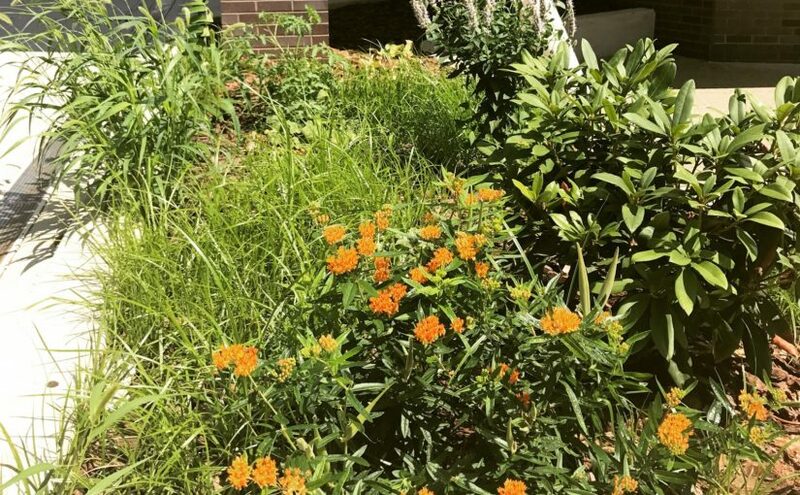 Native species are also adapted to your local environmental conditions, so there’s the added benefit of needing to use less water when irrigating these plants. Some of our favorite pollinator-friendly native plants to work with, include: Agastache foeniculum (anise hyssop), Liatris microphala (dwarf blazing star), Asclepias tuberosa (butterfly weed), Asclepias incarnata (swamp milkweed), and Echinacea purpurea (purple coneflower). 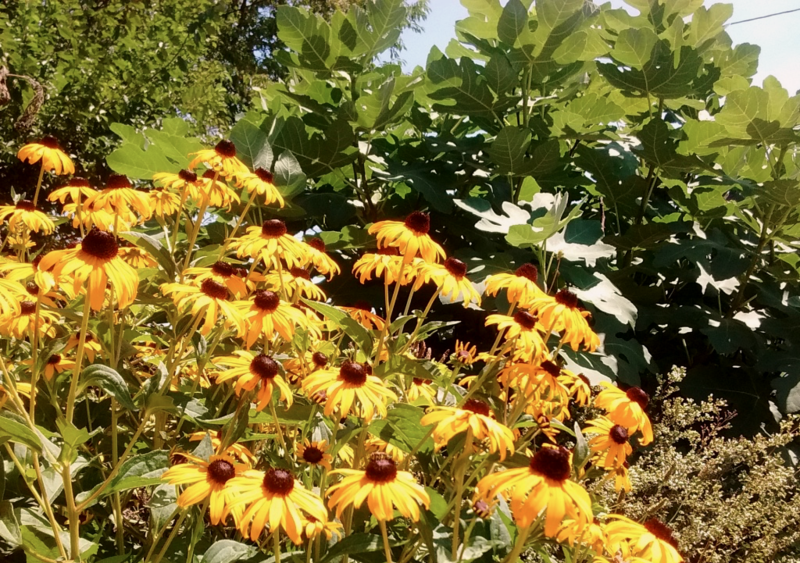 At POP’s orchard at Saint James Church, the seed heads of brown-eyed susans (Rudbeckia fulgida) will provide a late-season food source for local goldfinches. Talk to your local nursery about their native plant options to get started. 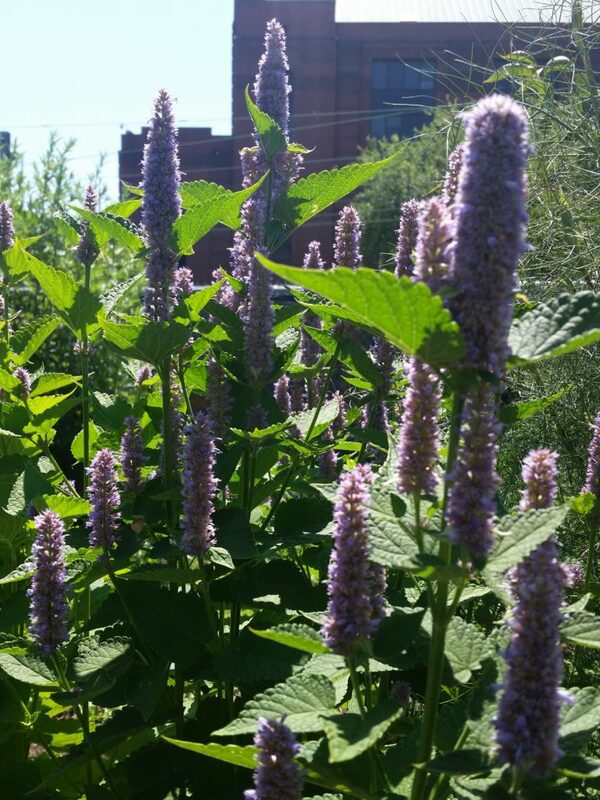 Pro tip: Steer clear from butterfly bush (Buddleja spp.). We know it’s beautiful, and I’ve even been guilty of planting this beauty from time to time. However, the problem with butterfly bush is that it’s an invasive species that can spread like crazy and disrupt local food webs. What butterflies really need are host plants for their larval offspring to feed on the leaves. Butterfly bush isn’t really helping in this department. 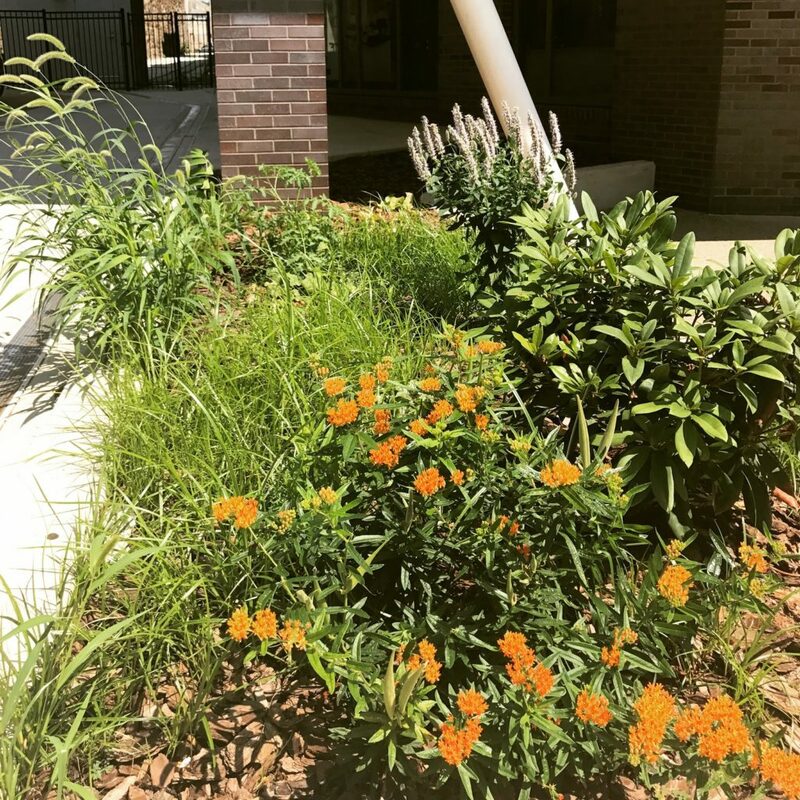 A small pollinator garden (anise hyssop, butterfly weed, and coneflower) installed at Paseo Verde Apartments by PLANT GROUP LLC. Multiple Bloom Times. You want to make sure to include a plant palette with diverse bloom times. The first reason you do this is so that your garden stays lovely and colorful from the spring through the fall. For example, dwarf blazing star gives off stunning magenta spikes that look great through September. The other reason why it’s important to diversify bloom times is that you’re essentially turning your landscape into a pollinator buffet open throughout the growing season! Mix Up Color & SIze: You ever hear the phrase, “Different strokes for different folks” ? It also applies to pollinators. For example, while scarlet bee balm (Monarda didyma) attracts butterflies and hummingbirds, while tiny native bees like small flowers like yarrow (Achillea spp.). Try to diversify your plant selection as much as possible to invite all your new friends to the party! Clusters Are Key: First of all, planting your plants in clusters of like variety looks gorgeous. Pollinators also dig plantings en masse! Bees like to forage nectar and pollen from a single plant species, something called “flower constancy” by biologists. Lose the Lawn: While folks in the ‘burbs might love turf grass, it’s essentially useless for pollinators. I’ve actually gotten into arguments about removing certain plants viewed as “weeds” by homeowners or property managers. Luckily, the manicured look is a little out of style, and urban meadows are starting to hit the scene hard. White clover is a nitrogen-fixer that can actually help improve lawn health, and bees love it! Swamp milkweed stealing the show at a PLANT GROUP LLC bed near the Temple University SEPTA stop. Urban Planning: While starting with your own garden or green space is the first step to designing pollinator-friendly environments, there’s also a need to understand how to effectively plan and design green spaces at the neighborhood level to mitigate fragmentation from urban development and maximize habitat connectivity in developed areas. When looking at larger scale pollinator habitat restoration, the following tools/ideas show promise: 1) GIS (Geographic Information Systems) for comprehensive mapping of existing habitat, to inform future green space development opportunities; 2) Cross-disciplinary coordination with multiple stakeholders (farmers, beekeepers, homeowners, etc.) to facilitate effective site design and planning; 3) Citizen science / community-based monitoring efforts to enable large-scale tracking/monitoring of existing and future habitat. Imagine what your city will look like in 20 years. What comes to mind? Robots serving you beet juice, pills to make you smarter, VR to experience every human feeling….maybe. What about pollinators? Dancing around — bringing color and life to the air. Where do they fit in this brave new world? We can choose to ignore the signs, treating our non-human denizens as another strange natural byproduct standing in the way of progress. Or we can realize what these organisms truly are; life’s dedicated workforce — bringing us sustenance and beauty with each season. We can continue to design human habitats only for human needs (or at least the needs of the privileged). Or we can grow a different design aesthetic, at the same time new as it as old, to open the doors of our built environment and let life in. Berenbaum, M., Bernhardt, P., Buchmann, S., Calderone, N. W., Goldstein, P., Inouye, D. W., … & Robinson, G. E. (2007). Status of pollinators in North America. Washington, DC: The National Academies Press, 668569904, 9780309102896. Colding, J. (2007). ‘Ecological land-use complementation’ for building resilience in urban ecosystems. Landscape and urban planning, 81(1), 46-55. Goddard, M. A., Dougill, A. J., & Benton, T. G. (2010). Scaling up from gardens: biodiversity conservation in urban environments. Trends in ecology & evolution, 25(2), 90-98. Rudd, H., Vala, J., & Schaefer, V. (2002). Importance of backyard habitat in a comprehensive biodiversity conservation strategy: a connectivity analysis of urban green spaces. Restoration ecology, 10(2), 368-375. Tommasi, D., Miro, A., Higo, H. A., & Winston, M. L. (2004). Bee diversity and abundance in an urban setting. The Canadian Entomologist, 136(6), 851-869. U.S. Department of Agriculture. (2013). USDA and EPA Release New Report on Honey Bee Health. U.S. Fish & WIldlife Service. (2017). Pollinators. 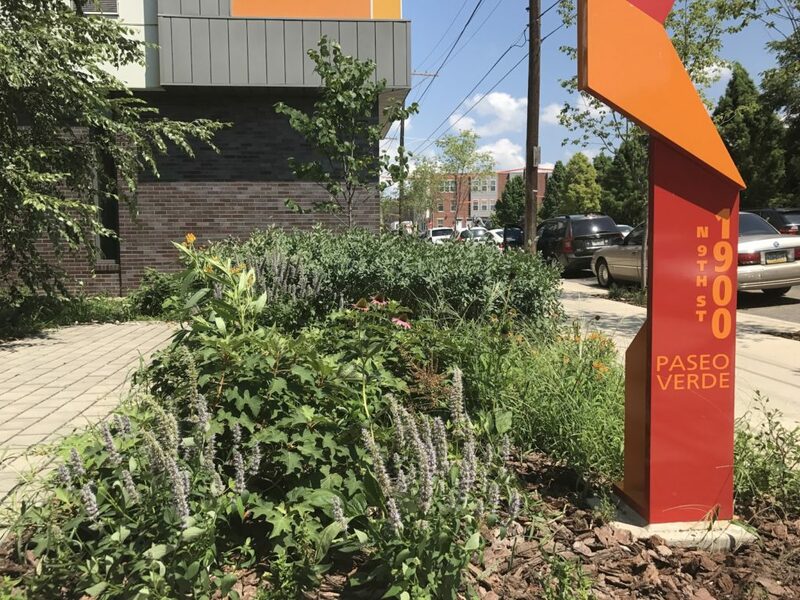 This POP blog post was written by Austin B. Arrington (LEED GA), Executive Director at PLANT GROUP, LLC — a Philadelphia-based green design-build firm with a focus on green infrastructure, sustainable landscaping, rainwater harvesting, irrigation, and environmental monitoring. Austin holds a MS in Environmental Science from SUNY-ESF and is a published researcher/writer in urban ecology.